Fourth quarter diamond production of 485,616 carats recovered from the processing of 605,960 tonnes of ore at an attributable grade of 80 carats per hundred tonnes (“cpht”). Grade and carat recoveries improved by 45% and 47% respectively compared to the third quarter, attributed to the mining of higher grade ore and an increase in tonnes processed. Fourth quarter sales of 253,929 carats sold in two tenders for gross proceeds1 of $31 million2, at an average price of US$92 per carat ($122 per carat2). Fourth quarter diamond sales represent diamonds mainly recovered during the third quarter. FY2018 diamond production of 1.32 mcarats recovered from the processing of 2.33 mtonnes of ore at an attributable grade of 57 cpht. FY2018 run-of-mine diamond sales of 1.04 mcarats sold in nine tenders for gross proceeds1 of $141 million, at an average price of US$105 per carat ($136 per carat3). In addition to run-of-mine diamond sales, 0.16 mcarats of supplemental diamonds were sold in FY2018 for gross proceeds1 of $4 million, at an average price of US$16 per carat ($21 per carat3), for a total of 1.20 mcarats sold. In addition, Stornoway is providing production, sales and cost guidance for FY2019. Highlights are presented in Table 1. Two tender sales were completed during the fourth quarter. In total, 253,929 carats of run-of-mine production were sold, representing recoveries between July 21st and October 5th 2018. Gross proceeds1 were $31 million2 at an average price of US$92 per carat ($122 per carat2; Table 1). On a segmented basis, 190,187 carats of +7 DTC sieve size diamonds were sold at an average price of US$118 per carat ($157 per carat2), and 63,742 carats of -7 DTC sieve size diamonds were sold at an average price of US$15 per carat ($20 per carat2). In addition to the sale of run-of-mine production, an additional 58,313 carats of supplemental diamonds smaller than the -7 DTC sieve size were sold in an out of tender contract sale for gross proceeds1 of $0.83 million2 at an average price of US$14 per carat ($19 per carat2). The supplemental diamond production represents recoveries of small diamonds produced between July 21st and October 5th that are in excess of that expected from the Renard Mineral Resource. The achieved pricing of US$92 per carat for run-of-mine goods during the quarter represents a decrease of 11% compared to the third quarter. The sales for the quarter continue to reflect a challenging rough diamond market over the period. While the pricing of higher quality goods and specials remains strong, certain categories of lower quality goods saw weaker prices in the fourth quarter. These categories include -7, brown and rejection goods. For FY2018, 1.04 mcarats of run-of-mine production were sold for gross proceeds1 of $141 million4, at an average price of US$105 per carat ($136 per carat4). In addition, 164,322 carats of supplemental diamond production were sold for gross proceeds1 of $3.5 million at an average price of US$16 per carat ($21 per carat4). Table 2 summarizes FY2018 sales. Stornoway sells its diamond production in an open market by tender and, other than in exceptional circumstances, is a market price-taker. To monitor this marketing strategy, a market real price index is generated using Renard sales data. The real price index trend shows a steady increase (+27%) in the real price index from the first sale in November 2016 to June 2018, as the rough market conditions improved, goods quality and size improved and tender viewing and bids increased as buyers’ familiarity with the Renard production increased. The second half of 2018 saw a significant rough market price correction resulting in a price index decrease of -13% as compared to June 2018 index. This market decline is partly attributed to the further weakening Indian Rupee, the lack of available credit available to Indian diamantaires, and the fluctuating seasonal effects caused by important Indian and Jewish holidays in the third and fourth quarters. Fourth quarter mine production was 485,616 carats recovered from the processing of 605,960 tonnes of ore at an attributable grade of 80 cpht. During the quarter, mill feed was derived from the Renard 2 underground mine (92%), the Renard 65 open pit (6%), and Renard 3 underground development (1%). Processing rates in the quarter averaged 6,600 tonnes per day, compared to an annual plan of 7,000 tonnes per day. Processing rates were affected by the oversized material coming from the underground mine, and are expected to increase to nameplate capacity with the improvement of rockbreaking capacity on the primary crusher pad. Full FY2018 year mine production was 1.32 mcarats recovered from the processing of 2.33 mtonnes of ore at an attributable grade of 57 cpht. Carats recovered and processed were below the low end of the revised guidance, due to lower tonnages processed in the second half of November and December resulting from technical issues with the front-end of the process plant. Carat recoveries in 2018 were affected by delays in the ramp-up of the Renard 2 underground mine, the processing of low grade stockpiles to curtail the shortfall in mined tonnes during the transition from open pit to underground operations, and the mining of lower than expected grades at the margin of the orebody during the initial phase of the underground ramp-up. By the end of the third quarter, the ramp-up of underground production at Renard 2 was completed, and a steady feed was achieved from underground operations. Figure 1 summarizes underground ore tonnage hauled to surface. Recovered grade improved by 39% and 45% in the third and fourth quarters, respectively. Carat recoveries improved by 47% in both the third and fourth quarters. Carat recoveries missed the bottom end of the guidance range due to the process plant performing at lower than nameplate capacity in the second half of November and in December, due to the aforementioned factors. For FY2019, Stornoway will report total carats recovered, inclusive of all size fractions, when providing recovery, sales and pricing guidance and results. Reporting will also be segmented by two size segments (larger and smaller than the +7 DTC sieve size). 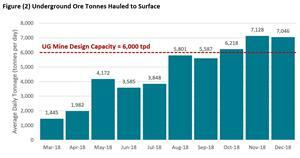 In 2019, Stornoway expects to produce between 1.80 and 2.10 mcarats from the processing of 2.40 to 2.55 mtonnes of ore. Ore will be derived primarily from the 290 meter level of the Renard 2 underground mine, with additional production from the Renard 65 open pit. Starting in the second quarter, Renard 3 underground ore is expected to be available to supplement Renard 2 production. FY2019 production guidance reflects the steady-state operations at the 290 meter level of Renard 2 underground mine and improvement in grades demonstrated in the fourth quarter, with further operational flexibility and grade increases expected once Renard 3 underground ore becomes available. Between 1.80 and 2.10 mcarats are expected to be sold in 8 tender sales at prices between US$80 and US$105 per carat. In 2019, total carats sold and achieved pricing per tender sale will be reported inclusive of the supplemental production. Price guidance has been established based on historical achieved diamond size distribution and sales performance. Market influence is deemed to be the main variable to the pricing range. Any improvements in the quality and size distribution of Renard’s diamond production that is achieved from ongoing process improvement initiatives would be expected to be reflected in the realized pricing for the +7 DTC sieve size product segment. For FY2019, cash operating costs are estimated at $120 to $130 million, representing $47 to $54 per tonne processed or $57 to $72 per carat recovered. 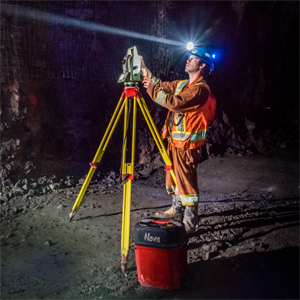 FY2019 capital expenditures are estimated at $70 to $80 million, principally related to the development of the underground mine at Renard. During FY2019, Stornoway’s exploration activities will focus on the Renard Project and providing growth through new projects, including the continuation of an underground drill program initiated in 2018 to test the depth potential of the Renard 3 kimberlite below the base of the currently defined Mineral Reserves. The objective of this drill program is the conversion of Inferred Mineral Resources and Targets for Further Exploration (“TFFE”) to Indicated Mineral Resource and, if warranted, new Mineral Reserves. In the current statement of Renard Mineral Reserves and Resources, Renard 3 comprises a Proven and Probable Mineral Reserve of 1.85 million carats (2.08 million tonnes at an average grade of 79 cpht) to a depth of 255 meters. However, the Corporation believes significant opportunity exists to expand it to greater depths, and in turn extend mine life. A 2014/15 deep directional drilling program at the adjacent Renard 2 kimberlite intersected 126.6 meters of kimberlite interpreted as belonging to Renard 3 at a vertical depth of approximately 1,000m (implied true width was a minimum 47 meters). This represents over 500 meters of untested exploration potential in the intervening undrilled levels, and a TFFE of between 3.5 and 6.4 million carats (comprising 3.4 to 3.8 million tonnes between 105 and 168 cpht). It is also planned to further test the Renard 9 kimberlite with drilling from the existing underground mine workings. The economic assessment of a Renard 4-Renard 9 open pit, which would require a water retention structure within Lagopède Lake, is ongoing. Exploration at Renard will also target the upside potential of kimberlite bodies not currently in the mine plan. A staged, multiphase program will evaluate the economic potential of the Renard 7 body as an additional potential source of open pit mill feed. Renard 7 lies entirely on land, about 700m north of the Renard 65 open pit, and was previously tested by seven historical drill holes for which no archived core is available. Renard 7 is currently interpreted as a diatreme of greater than 120m in diameter, dominated by pipe filling tuffisitic kimberlite, with extensive hypabyssal kimberlite on the south side. Renard 7 is currently classified in the March 2016 NI 43-101 Technical Report as a TFFE of between 6.3 and 9.4 million tonnes in size, with a possible diamond content from 30 to 40 cpht. The Corporation considers this estimated diamond content as a minimum value, and one purpose of the Phase 1 exploration program (3,200m in 15 holes) is to produce a better estimate. The potential quantity and grade of any TFFE is conceptual in nature; there is insufficient exploration to define a mineral resource and it is uncertain if further exploration will result in the target being delineated as a mineral resource. Other exploration upside at Renard will be considered on an ongoing basis. Stornoway also maintains an active portfolio of grassroots diamond exploration projects within Canada. Results of work from the 2018 programs of sampling, geological and geophysical surveys, and drilling are still being received, and will be evaluated to assess whether additional work is warranted. Disclosure of a scientific or technical nature in this press release was prepared under the supervision of Mr. Patrick Godin, P.Eng. (Québec), President and Chief Executive Officer and Mr. Robin Hopkins, P.Geol. (NT/NU), Vice President, Exploration, both “qualified persons” under National Instrument (“NI”) 43-101.